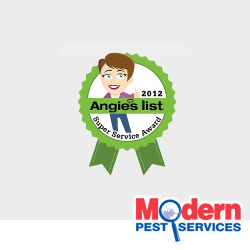 Modern Pest Services has earned the 2012 Angie’s List Super Service Award! This award is given each year to the top 5% of all the companies rated on Angie’s List. If you are not familiar with this company, Angie’s List is the nation’s leading source of consumer reviews on local service companies. With customer service and customer satisfaction being our number one goal with each and every pest control service we provide, we are honored that our customers have left reviews that say the same. Our pest control services are designed to suit the needs of our client’s no matter how severe or complex the pest problem at hand. With integrity being the cornerstone of our company, we are proud to be a 2012 recipient of the Angie’s List Super Service Award! If you would like to learn more about our pest control services for homes in Maine, Massachusetts and New Hampshire and pest control services for the commercial sector in New England, simply contact us today.